Description: Steel side trawler; single screw, motor. Tonnage: 73 grt 26 net. Engine: Lister Blackstone EVSM4; 216 hp. = 10.5 kts. Managers: Norrard Trawlers, Docks, Milford. Notes: 10 Dec 1959: 30 miles SE of Flamborough Head, sprang a leak in the engine room during a gale. The crew of five (skipper Ernest Neal) took to the inflatable liferaft, and were picked up by WAR DUKE GY1037. The skipper and mate went back aboard and attached a tow rope. While under tow at 2 kts, a heavy sea hit her, and she went down 14 miles from Spurn Point. Britain's smallest all steel trawler, compact, well planned and only 73 feet overall, arrived at Milford haven on Tuesday night to join the fishing fleet at the port. She is the £40,000 motor vessel Janet Helen, built to the order of Booth and Croft, Ltd., of London, by the Fairmile Construction Company, Berwick-on-Tweed. She was brought round from the Berwick yard and will probably sail on her first fishing voyage from Milford on Saturday. The Janet Helen carries a crew of seven and will fish the drifter trawler grounds. She is being managed at Milford by a leading drifter trawler company, Norrard Trawlers, Ltd. The new vessel is likely to prove an asset to the Milford fleet and it is believed that more orders for the same type may follow. 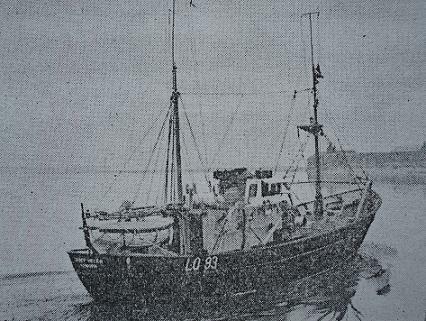 Equipped and rigged in conventional style for fishing from both port and starboard, the Janet Helen has a trawl winch belt driven from the main engine and on a miniature scale most of the equipment of a larger trawler. On her trials she attained a speed of 10.42 knots over the measured mile. Janet Helen's hull is basically similar to a design by the Frenchman, M. Giraud. The forward sections have slightly more flare to give a roomy working platform. In the wheelhouse Skipper Smith, besides having Decca Navigator, Kelvin Hughes Echo Sounder and a Woodson W/T, R/T and D/F set has full control of the engines to hand, with a panel showing oil pressures and engine revolutions. Accommodation below decks is for four crew in a main cabin, with cabins opening off for the Skipper, Mate and engineer. Lifesaving equipment consists of a 14ft. ship's boat carried in the stern and an R.F.D. inflatable life-raft stowed in the deckhouse. To sum up, in the words of a Milford skipper who inspected the new ship on Wednesday, "She is a little beauty." she may be followed by others of her type. She will fish with our drifter trawler fleet and will be in charge of Skipper Wally King and a local crew. The 73ft. trawler "Janet Helen" which was transferred from Milford Haven to Swansea after completing 15 trips landed a total weight of fish at Milford of 14,233st. of which 411 st. remained unsold. The amount of money including subsidy, which resulted from the sale of this fish was £9,270 which works out at an average of £618 per trip. The average stonage per trip was 950 approximately. During the whole of the time at Milford "The Sputnik's" fuel bill amounted to £800 and ice bill to £177.